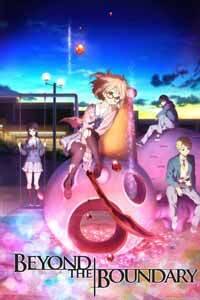 Distributor: Currently licensed by Sentai Filmworks, but also available through various streaming venues. Notes: Based on a light novel series written by Nagomu Torii, with illustrations by Tomoyo Kamoi. Young (and attractive) superpowered Spirit World Warriors, some "good" youmus ("monsters from the Id", supposedly, that are nevertheless on OUR side, and ALSO appear as young and attractive humans), and a "half-youmu" (need we say how HE looks? ), join together to battle nasty, ugly youmus with sharp teeth, tentacles, and very bad attitudes. The first thing that happens in Beyond the Boundary is that our male hero Akihito Kanbara tries to help a damsel in distress, one Mirai Kuriyama, and she thanks him by running a sword through his body. Now, I'd recently seen this exact same thing happen in So I Can't Play H, and it occurs to me that in real life this sort of behavior seldom leads to second dates. Fortunately, Akihito, as a half-youmu, is immortal, and has a fetish for girls wearing glasses, so is willing to overlook this murder attempt, and several subsequent ones, by the myopic Miss Mirai. Beyond the Boundary throws a LOT of arbitrary events and bizarre individuals at you, typically with no more than a perfunctory explanation at best, and there was still so much I didn't understand at the end: What did the villain actually hope to gain by the scheme? Was anything lasting accomplished at all by a certain major battle? The "Spirit World Warriors" are apparently recruited by a shadowy organization (I think it's actually CALLED that, somewhere), which also pays them by each youmu destroyed (youmus, when destroyed, turn into rocks), and even sets the bounty for each particular youmu, but the show offers more hints than solid information about any of this. And I PARTICULARLY wanted some more details about a certain tragic event in Mirai's past. Mirai is quite a mixed bag of a character. "Glasses fetish" aside, she really IS cute (great character design! ), but her personality is a bag of tics. Her particular supernatural power is an ability to form swords from her own blood (understandably leaving her anemic afterward.) She's regarded as a bit of a pariah by her fellows, and it doesn't seem to be just because her power is so icky. She's incredibly energetic, and acrobatic, in fights- the show DOES have some good combat set-pieces, and some genuinely imaginative moments in a battle with a youmu called The Hollow Shadow- and all I can say is that as a fighter, she'd make a great recruit for any superhero team. (Do The Avengers have an opening?) And to the show's credit, while it leaves so much unexplained, it DOES go back and give us some of the history of Mirai's (at least initial) animus toward Akihito. (Really, this show makes you feel eternally grateful when it fills in any part of one of its puzzles.) On the negative side, she's frequently sulky, sometimes self-pitying, and her catchphrase, "How unpleasant! ", grates after a while. She also tends to withhold crucial information from Akihito, but of course in this she's hardly guilty of any sin that isn't common practice in this series. The show's attempts at humor are mostly aimed at those otaku fetishes; it's one of those shows that wants to have its cake and eat it too, showcasing the fetishes while aiming droll jabs at them, to demonstrate that it's actually above all that, I suppose. Alas, it's not above it, it wallows in it. But I WAS amused at one episode that kind of broke out of the mold. In it our heroes want to take on a particularly lucrative youmu that drenches any attackers in stink-slime. After numerous failed attempts (followed by hot showers), our group contrives an elaborate plan to "distract" it- involving putting on a musical performance (! )- but they've forgotten one important detail. It's the most genuinely funny bit the show has, and also maybe its most accessible bit of plotting. Recommended Audience: Mild fanservice (including some fetish and cosplay.) Lots of skewering of Akihito though, and some horror elements. Mid-teen and up.